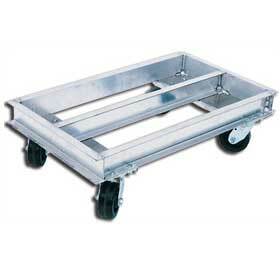 Sturdy aluminum dollies are constructed of aluminum channel and supports loads up to 2000 lbs. Lightweight design allows personnel to conveniently pick up and carry to destination. Extra mobility on four - 5 x 2" poly-on-steel casters. FOB Shipping Point. Product No. Cap. (lbs.) Deck Height Size W x L Wt. (lbs.) Price Ea.